If you’re looking for that perfect small, luxury hotel in inland Malaga that offers personal service, home cooking and a touch of luxury away from the hoards of beach-worshippers you need to head inland from the coast to the mountains or in this case the Serrania de Ronda. Inland Malaga province has vast and beautiful swathes of nature, from rolling hills and moutain ranges to the stunning karstic limestone landscape of El Torcal. I’m going to introduce you to two very different yet equally lovely small, rural hotels. The first one in this post is Hotel Castaños in Cartijima in the Serrania de Ronda near the town of Ronda north-west of Malaga airport. Cartijima is a charmingly small, unspoilt town in great walking country. Walk from the doorstep and lose yourself in pure nature, or follow waymarked routes for as long and far as you please. After a day’s walking just relax on the roof terrace or in the hotel lounge and dine on Di’s home award-winning Mediterranean-fushion cooking while sampling local wines or unusual gins. Each room is individually decorated with views of the town and/or the horizon-reaching mountains. For even more impressive views the pretty plant-filled roof terrace provides a great relaxing, star-gazing, painting or drawing setting. For those who can doodle, you don’t even need to bring your own materials, they are provided in your room. Day or night the roof terrace is one place you will certainly spend some time. I did. I couldn’t take my eyes off those views and although I took lots of photos I really wished, up there in the silence and warmth of siesta time in rural Spain, that I could draw well. When life is slowed down for you by your surroundings you learn to appreciate the simple things of life. The peace, the lack of rush, hustle and bustle. When you’ve visited Hotel Los Castaños you will want to return. Everybody does. 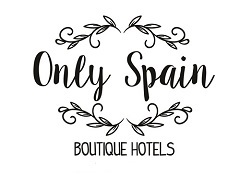 See Hotel Los Castaños on Only Spain Boutique Hotels my boutique hotel collection. The second small and luxurious inland hotel will be Cortijo Sabila in Villanueva del Rosario, Malaga – coming soon. Or see it now on Only Spain – Cortijo Sabila.